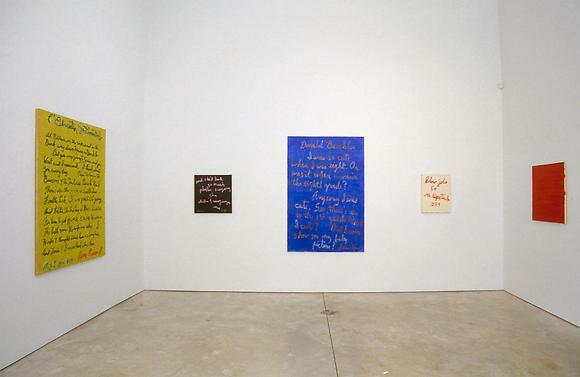 Cheim & Read is pleased to announce an exhibition of paintings by Jeff Perrone and Rene Ricard. Born in 1953, Jeff Perrone works at the intersection where West African fabric, Indian miniature color, and Southwest Native American form flow into abstract painting. Perrone combines, transposes, and joins together the materials, structures, and processes that engage the history of world culture, across time and continent. Sewn buttons function as pointillist accretions that define rectilinear, curved, or gently bending, totemic bands of color. The buttons are modern equivalents of the shells and beads used the world over, in everything from everyday, functional clothing to the most sacred sculpture. Colored sand adds inflections of Tibetan, Anasazi, and Aboriginal art -- traditions where content and process unite to form a material amalgam of forces that achieve the dynamic balance the Navaho call hozho, a beauty without pain. Applied in multiple layers, the sand yields an alternately hard, granulated texture, and a soft, pliant one, like the Kuba raffia mats of Zaire or nomadic carpets of the Turkman. Perrone's pictorial hybrid is a variety of painting-without-paint, a migratory art, grounded by Malian mud cloth (bogolanfini), and indebted to the geometries of both Incan weaving and South African Basotho house murals. To this cluster of mixed origins, the artist applies painted wood moldings, a framing device similar to that used by the Igbo women of Nigeria, who embellish the windows, doors, and walls of their dung-and-mud houses with lumber fragments, which they recombine, in a highly stylized way, to suggest both animist and Islamist motifs. Drawing upon this communal pool of aesthetic knowledge, and incorporating "immigrant" and recycled materials, he creates a recombinant collage, built upon directional shifts and syncopated movements -- like those of Afro-Cuban jazz, or the sound-sampling mixologies of the turntablist DJs, who, as Basotho women say of their art, "beat out a rhythm across the wall." Perrone situates his work within this cultural multi-verse, in a reverse colonization process: a migration into painting space that has the flavor of lived, urban life -- a context embracing the cultural criss-cross. His pidgin painting, speaking in an aesthetic patois, inhabits a sphere where difference is a breeding ground encouraging ever more variety, and diffusion. Such an influx reflects a life of interchange, from the textile importers on 125th Street to the Ukrainian button sellers at the 26th Street flea market. It can be seen anywhere: from an Indian woman on 34th Street, in a pink and gold sari under a Harris tweed blazer, ordering jerk chicken; to a Somali woman, in a banana-leaf print dress, and a black-and-white checkerboard fake fur, sitting in a Thai restaurant on Bayard Street. Born in Boston, Rene Ricard was a part of Boston's literary life in the early 60's, which included the poets John Broderick, John Wieners and Steven Jonas. By the age of seventeen, Ricard was a leading figure in the New York cultural scene that surrounded Andy Warhol's Factory. He appeared in such Warhol classic films as Kitchen, Chelsea Girls and ****(Four Stars). As a performer, Ricard was a founding participant in the Theater of the Ridiculous, collaborating with John Vaccaro and Charles Ludlam. The artist has published four books of poetry: Rene Ricard 1979 - 1980, God With Revolver, Trusty Sarcophagus Co. and Love Poems. In the late 70's Ricard began to paint his poems. Occasionally he would paint the words directly onto paintings found in flea markets. In a twist on the notion of a found painting, he has recently been painting his own "found images". Onto these background paintings he inscribes his terse, jarring poetry. In other recent works the artist eschews background imagery, painting longer poems against solid colors, reminiscent of Japanese scroll paintings in their sparse compositions.